A while back we published this video above on setting up the Adtran Total Access 908e as an FXS gateway. To recap a little, an FXS gateway allows you to connect analog phones or stations, to a VoIP based system. It does that by providing an analog interface like an FXS port to which you connect your analog phone, and through the use of witchcraft, translates the signal from analog to digital. To clarify a little bit more if you’re new to this technology: when we talk about analog gateways, we are generally referring to two types of interfaces, or ports; FXS and FXO. FXS stands for foreign exchange station, but to get to the points, it’s what PROVIDES dial tone to a device like a credit card machine, fax machine, or an analog phone. FXO stands for foreign exchange office, and RECEIVES dial tone. An example of an FXO port would be on a modem. So say it with me, FXO PROVIDES dial tone, FXO RECEIVES dial tone. It’s Easy! Now that we’ve gotten that out of the way, let’s talk about hotlining. Hotlining is when an FXS port automatically dials a predetermined number when off hook. You’d see this sort of setup on common are phones (door entrances, hallways, lobbies, etc. ), or in elevators. The idea is simple: restrict what the user can do with the phone. To achieve this on an Adtran Total Access 908e, it’s simple, sort of. You can configure roughly 90% of the Adtran Total Access 900 Series devices through the graphical user interface, but there are some nifty features hidden in the command line, like hotlining! The good news is configuring a hotline using the command line is about as complex putting on your own socks. Make sure your dial plan is configured to accept the digits you plan on calling when your FXS port goes off hook. Have a trunk group also accepting the digits and have a trunk to send the call to. Know your current, or default passwords. 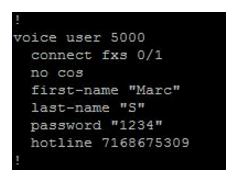 As an example, we’ll create a user “5000” and configure a hotline for that user on FXS 0/1 to dial 716-867-5309 when off hook. 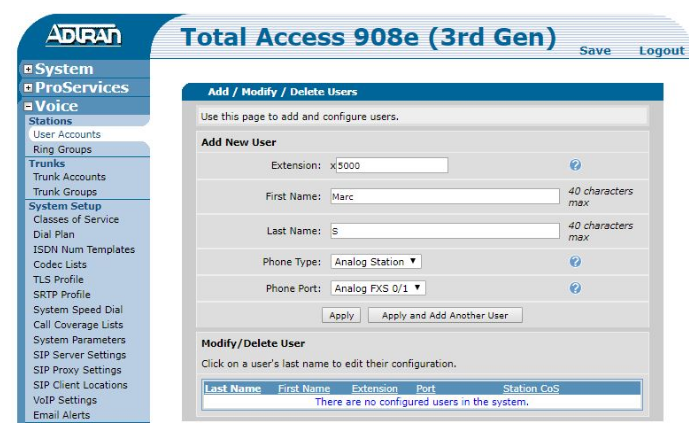 Log in and create the user: Got o Users Accounts and fill out some basic information such as first, last name, and select “Analog Station” as Phone Type. Select FXS 0/1 and click Apply. Now, when any device connected to FXS 0/1 goes into an off hook state, the Total Access 908e will dial 716-867-5309. I told you it would be easy. To be honest, the Adtran Total Access 900 line is capable of a lot more, and it’s one of my favorite pieces of equipment. Not to overuse the term, but I consider it the true Swiss Army Knife of the telecommunications world. Learn more about it by visiting Adtran’s site, or calling VoIP Supply at 1-800-398-8647.